This week’s post is brought to you by my horrible memory. Backstory ~ I was looking through my sketches to start preparing my tutorials for March when I came across the mini butterfly that I had made for my Easter eggs last year. At the end of that post, I promised I would share how I made the quilled monarch butterfly that I used on one of the eggs. Almost a full year ago. I had totally forgotten all about it! This week, let’s make a mini quilled monarch butterfly. The monarch butterfly is known for it’s bold orange and white pattern, but the key to making it look as real as possible is how the black is added. Each wing has 2 segments, and the left and right sides are mirror images of each other. In this template I created, I separated the top and bottom of each wing to make life a little easier. Click on the image below to print your own butterfly template. For the top, roll and shape 2 teardrops from 6″ orange strips, and 1 teardrop from a 4″ orange strip. The bottom teardrops are made from 2 4″ strips of orange. Once dry, wrap each teardrop twice with a black strip. Place them over the teardrop shapes on the template with a thin line of glue between each and pin so they are pushed very close together. Next, roll 7 tight coils from 1 1/2″ strips of white. Wrap each in 2″ of black and let dry. Line each up over the circles on the template. Add a dot of glue at the places where the coils meet the teardrops. To round out the wings, add tight coils of black made from strips of 2″ or so. There are no exact measurements for this step because sometimes the coils will need or be a tiny bit larger or smaller. Don’t be afraid to make a mistake here. In fact, when I was photographing this tutorial, I ended up needing one less coil on each wing than I had practiced! It’s just paper, so if you have to roll a few extra coils to get the wing the way you’d like it, so be it. When all your shapes are set, wrap each segment with black. When the 2 segments are completely dried, glue them together to form the whole wing. 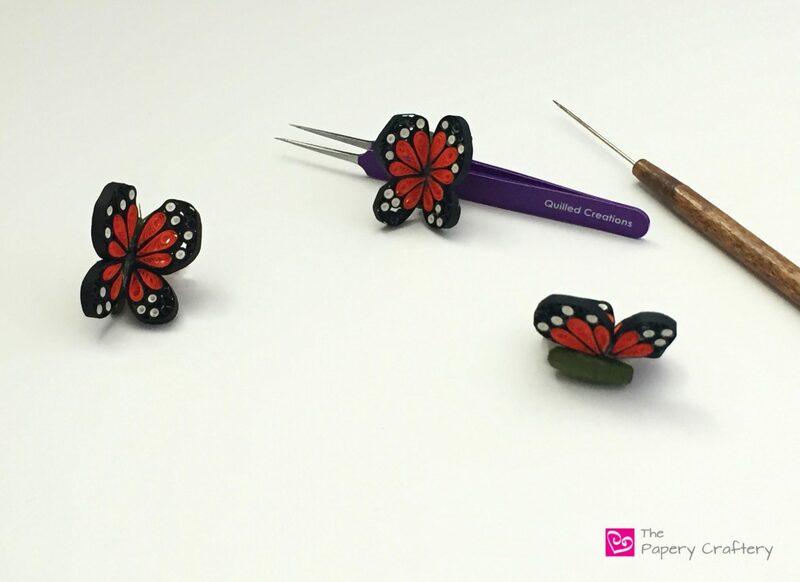 Now you could stop right there, glue the 2 wings together and have an adorable mini quilled monarch butterfly to place on your next project. Or, you could make a little body for your butterfly and mold the wings so they look like they’re in motion! For the body of the quilled monarch butterfly, I used a variation of the technique used to make the long cones in this video. The difference I made (obviously in addition to not making earrings) is the I let the paper build up a little at the base of the slotted tool before moving on to add length. Once the quilling paper forms a small coil on the tool, gently pull up as you roll so the shape becomes a tube. I found it helpful to brush a bit of glue every few turns once I started adding length. When you’ve got the size that works for you, carefully rip the excess and glue the end to secure. I used this technique to make the butterfly body in two pieces. One is a bit longer and thinner at the end than the other. The wider end will be the head. Glue the two halves together with a thin line of glue. To make your wings look like they’re in flight, glue them together at an angle. Wedge a few pins around the butterfly to keep it in shape as the glue dries. The quilled monarch butterfly body can be glued in place right where the wings meet. I just love the graphic quality of these little insects! The orange and white are so bold against the black of the wings. And the leaf green body acts as a neutral to ground it all. Think about adding some to your summer quilling! They’d also be sweet in one of the flower and vine hearts that I posted a couple weeks ago. Do you have any projects in mind for these butterflies? Tell us about it in the comments below!